Swim caps should be worn by anyone with long hair or competitive swimmers wishing to make faster times. Watch any Olympic swimming race, and you’ll notice that every racer wears one. Many pools these days also require the use of them so you should always buy best swim caps. Invented in the early 1900s, the first swim cap was made out of rubber. In the 1920s, latex caps began appearing. Later on, silicone versions hit the market. Some swimwear companies manufacture swim caps, including Speedo, Nike, TYR, and Dolphin. Most typically cost between $5-$10. Silicone tends to be the most expensive material but the most durable, while latex is the cheapest. A good swim cap will keep your hair dry and free of chemicals like chlorine as well as reduce drag. Always rinse and hang dry after use. Otherwise, the swimming cap will wear down much more quickly. Put it on carefully. No matter what the material, a swim cap can tear if handled roughly. You may want to wet your hair before putting the swim cap on if possible. This makes sure no air is trapped between the cap and your head. Otherwise, the cap could come off in the pool. Silicone swimming caps are the most popular. They never lose elasticity and last a long time. Latex is also a popular choice. Insulating caps made out of neoprene are commonly worn for triathlons or for swimming in cold water. 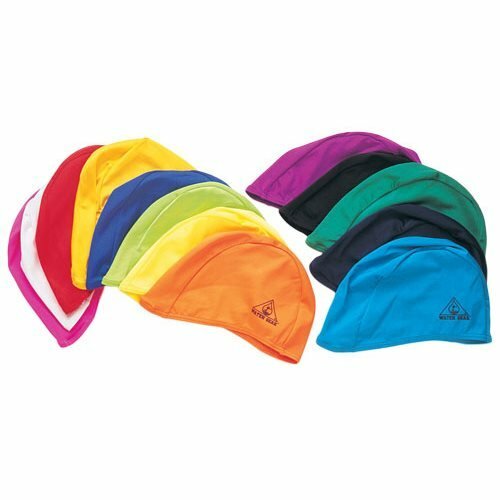 Swim caps can be found at any sports retailer that sells swimwear. From my experience, however, the best prices can be found online. Some like to buy locally so they can make sure they get the right fit, but if you have a normal-sized head, this shouldn’t be a problem. Swim caps are one size fits all for adults. Smaller kids versions are also sold. If you are a competitive swimmer, talk to your coach about wearing a swimming cap. He/she might have recommendations, or everyone on your team might wear the same swim cap. Whether you’re swimming for the first time or a seasoned veteran, I hope you enjoy your stay on this site. It contains a wealth of information- more than any other similar resource I’ve seen. As always, exercise safety in the pool. Swimming is a fun hobby I’ve enjoyed for years, but anyone who’s been around a pool for more than a few years has witnessed their share of accidents. Personal safety should be your top priority. $11.63 which is decent for this type of caps. Features: This cap’s look is very stylish. As compare to other Silicone caps it is soft and lightweight. It is comfortable and provides ultraviolet protection. Some people also call it bubble cap due to its bubble design. It is really good for kids because of its softness and attractive design. There are mixed reviews regarding long hairs and fitting of this cap. So check these two things before buying this cap.
. This is a budget cap with good quality. Features:As its name indicates, it is a wrinkle free cap so it will keep you away from famous dragging probable in swimming caps. It looks cool, stylish and clean. There are lots of positive reviews regarding the colour of this cap. Complaints from buyers:I am not sure whether size complaints are common for swimming caps, but there are slightly more complaints regarding cap size. Especially if you have long hairs or large head then select size carefully. Out of stock on Amazon. It is a good deal if you can get it under $10. Features:It is made by one of the best swimming brands in the world, i.e., Speedo. Its design is different than ordinary caps in the market and reason behind this unique design is hair pulling problem. Manufacturer’s concentrated on hair pulling problem. So you should consider it if have experienced this problem in the past. Complaints from buyers:Only one major complaint is there, and it is same size problem, and I think these buyers are not selecting size properly. So there is no major reason to reject this cap. Check on Amazon. It is more than previous caps but is Lycra cap, so more price is expected. Features:Elastic band at the bottom makes it more comfortable and easy to fit. Due to use of Lycra fabric, it dries very quickly as compared to average caps. It is a good cap for long hair swimmers or ladies swimmers. If your budget is more than $10, then you must go with this cap. 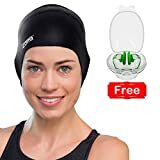 Reviews are good for Speedo Lycra Swim cap. Complaints from buyers:Wow! I haven’t seen any major complaint regarding this cap. Few buyers are not happy with capsize, but you can select a size, so it is not a serious issue. $8.26 . If you don’t want to spend much money one swim cap but want a good quality cap, then this is for you. Features: This is one of the best low budget caps for kids. It is not waterproof but comfortable. You can also use this cap to keep hair away from face and eyes. I will recommend this cap if you are not a daily swimmer. Complaints from buyers: Cap size is little bigger for less than 5 years old child. $14.99. So don’t worry about your money, you can return it if it is not a good product. It is expensive but a premium product that’s why the majority of buyers are happy. Features: You can easily stretch this cap to fit it according to your head size. Premium Silicon material is used which it makes more durable and attractive. It reduces the resistance as well as drags which helps to swim faster. I am personally recommending this cap. Complaints from buyers: No complaints! Really not a single major complaint from buyers. $10.95 . Manufacturers provide money back guarantee with this cap don’t worry about losing money. It is one-time investment. So the cap is not expensive if you compare the price with its quality and features. Features: Cap comes with great ear packet feature. So it increases the comfort level and reduces the overpressure on ears. You can also use ear plugs easily with this cap. Swim culture’s caps are very eco-friendly and odorless. I don’t know if you are lucky enough to have this much of money for swim caps. If yes then go this is for you. It is one of the best caps in the market today. Complaints from buyers: No Major complaints. This is expected when you are paying more money. Features: This is specially designed for recreational swimmers. I haven’t seen any other unique feature in this cap, but it is a very good combination of price and quality. Complaints from buyers: There is no major complaint about the performance and quality of this cap. Features: You can check these features and reviews below. Complaints from buyers: One complaint from some buyers is that it doesn’t keep hair dry. All other things are suspense. 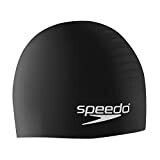 If you want to know why this cap is most popular and best-selling swimming cap on Amazon, then you can check everything about this cap below. The silicone swim cap is a modern innovation. Swimmers like them because of their durability and ease of fit. They are also less harsh on the hair and require less effort to take on and off. Silicone is a synthetic, heat-resistant compound used in some products. Most importantly, it’s an excellent waterproofer. It’s not just used in swimming caps, but also in aquariums, aircraft, and cookware. Swimmers have been using the latex swim cap for years. They are much less expensive than their silicone counterparts but aren’t an option for people with allergies to the material. Putting on a latex swimming cap could be compared to putting a balloon on your head, though the swim cap will be thicker. A lot of swimmers swear by latex, but competitors often prefer silicone. Which one you prefer is often a matter of preference. Lycra is a new swim cap material gaining in popularity. While not the cheapest option, they have very fast drying times and are popular with competitive swimmers. 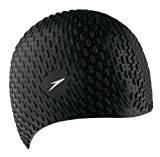 Lycra swimming caps do not insulate like latex and silicone do, so they are best suited for warm water or racing. They are very durable and don’t grab onto or snag hair. Casual swimmers will probably be more interested in another style swim cap as they are not designed to keep hair dry. Lycra swimming caps are for keeping hair out of the way, not necessarily protecting it. They are not waterproof and wear down after a few months of heavy use. But remember lycra is for those seeking a competitive edge. Neoprene is a synthetic rubber often used in aquatic gear. It is very good at insulating but also breathable. Neoprene swim caps are perfect for cold or open water swims and popular with triathlon athletes. Because of their special intended use, they cost nearly three times as much as a typical swimming cap.